I always enjoy my regular Sunday posts. It gives me the chance to share anything I have found over the past week. Very late Friday night whilst the boyfriend was snoring I was catching up on Facebook and something caught my attention. Many of you know about this as I have been bragging across Twitter. It was unexpected I had completely forgotten about it since I entered in June. I was shocked to open up the link and see my blog. I can not deny it makes me feel warm and fuzzy. I pass on my congratulations to the Winner and other runner ups. In case you were wondering the awards are judge by an Independent Judging Panel. 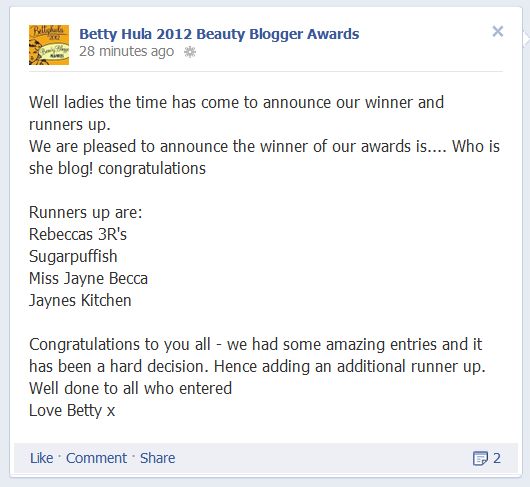 The criteria was Judges consider four main factors to select the winning beauty blog: style of blog and writing, investigative reporting and getting to grips with the issue, interaction with followers and readers, point of difference. The awards were open to every beauty blogger, regardless of how long you've been blogging, follower numbers or popularity. 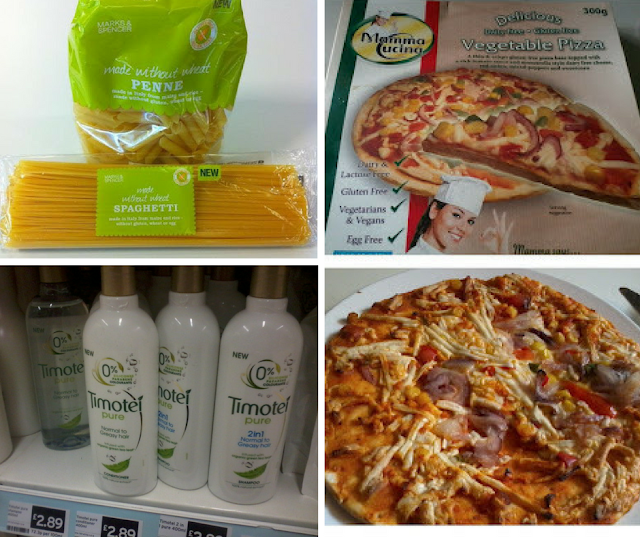 I saw a tweet this week from Marks & Spencer announcing the launch of gluten free pasta. I have asked the question whether this is also dairy and egg free and the response I got was YES it is. This week I tried Mamma Cucina Vegetable Pizza which is free from lactose, dairy, gluten, egg and suitable for vegetarians and vegans. I think it's awesome to see this kind of product on the market. It does not come cheap at £3.99 from Holland & Barrett. I was impressed with the gluten free base and overall taste but it was lacking vegetable toppings. Also at some point in manufacturing process the toppings had slid to one side. Great to try but I think I will stick to making my own pizzas. My H&B was also selling a dairy free Redwoods Cheese & Tomato Pizza which I have not tried. I think that's all folks, hope you are all having a relaxing weekend. Congrats on winning, very exciting :) I love my Pai muslin cloths, but they're a little pricey at $5 (but organic cotton isn't cheap.) I just bought some regular face cloths at Target until I have pennies to buy Pai. I didn't like the Suti brand cloths either. Thank you. I wasn't a fan of the Suti cloths either I don't recall trying a Pai one and I have used their products. The ones from Liz Earle are softer I find some cloths a little abrasive to start off with. Have you tried bamboo cloths? I have one from Tropic Pure Plant Skincare. A bit late here but well done on winning runner up!